The third preview video I want to share with you covers our new "Cycle Count" feature. As with other videos, it was filmed at our 1-day V4 training class in New Orleans on August 23rd. The new Cycle Count feature of entrée version 4 is an important new tool for your inventory management. It offers the ability to count a small subset of inventory in contrast with a traditional "physical inventory" which involves the counting of all items at one time. Cycle counts are less disruptive to daily operations, provide an ongoing measure of inventory accuracy and procedure execution, and can be tailored to focus on items with higher value or higher sales volume. You can specify which items should be counted with any or all of the following parameters: warehouse location range, item number range, specific class or all classes, specific brand or all brands, specific temperature zone or all zones, specific UOM or all UOM. You can next specify what "ABC Method" to use, which includes either Sales Volume or Item Value. Finally you can also specify how many items to return for counting including the Top 10, Top 25, Top 50 or All items. When designing this new Cycle Count feature, I spent a lot of time reading books on warehouse inventory control to brush up on my terminology and understand how others manage this process. One book which I found the most useful is Inventory Accuracy / People, Processes & Technology by David J. Piasecki, which you can find on Amazon. Besides Cycle Counting, many important aspects of inventory accuracy are covered, including how best to deal with multiple warehouse locations per item. In upcoming versions of entrée where we will be including our multiple warehouse locations per item feature, much of the techniques have been gleamed from here as well. I also want to mention that I examined other inventory control software, and found their Cycle Counting features to be extremely lacking. In fact, I don't understand how users of other software can do a true Cycle Count based upon how their software is designed. 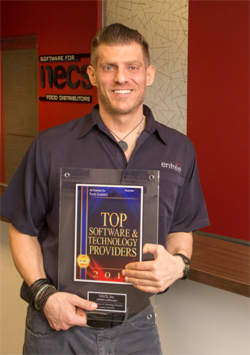 The bottom line is that a lot of time and effort went into the design phase of this project here at NECS, and I feel very confident that our approach is about the best you will find, even with systems costing into the six figures. Just the fact that you can start a Cycle Count process, and still have active use of your entrée software, is a major advantage in and of itself. One more comment about multiple warehouse locations: Currently entrée tracks a main warehouse location per item and one secondary location. This in my opinion is a major weakness. The majority of our customers require the definition of all warehouse slot locations, with the ability to designate primary locations per item along with unlimited overflow locations. At any time you need to know what item, how much of it and when it was received for each slot location. To make a long story short, this is coming and one of the most requested features from our users. I hope to provide you with more details about this in the next 3-6 months. The wait will be worth it as this closes the gap for us to have a world class warehouse inventory control system. Please note that to properly pull this off, you wil be required to use our EWM - Electronic Warehouse Manager app in combination with barcode label slot locations which are scanned anytime activity happens in that slot location. It is the only way to effectively manage the put-aways, movements and picking processes. The overall length of this part of the class was well over an hour. However the video is edited down to about 16 minutes to cover the highlights. 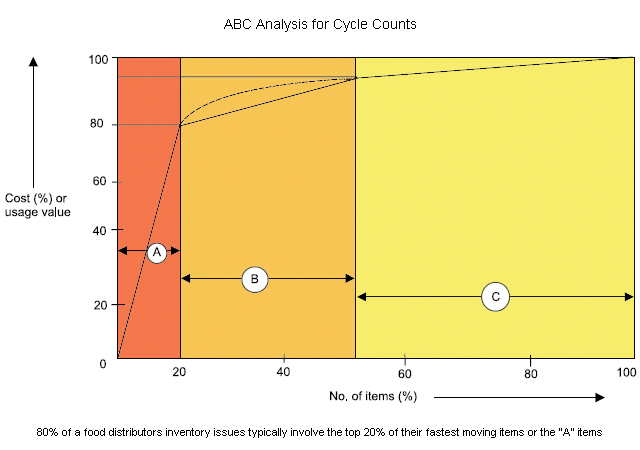 The ABC Cycle Counting method uses the Pareto principle as the basis for this technique. The Pareto principle states that, for many events, roughly 80% of the effects come from 20% of the causes. This method uses this principle to assume that 20% of the inventory in a food distributor's warehouse relates to 80% of the sales and also 80% of possible issues with on hand inventory. These are the “A” items. The principle is then extended to two other categories where “B” items account for 30% of the items and 15% of sales/on hand issues and “C” items represent 50% of the items in the warehouse, but only 5% of sales/on hand issues. When performing a Cycle Count, your warehouse manager will define the above criteria, and then provide counting assignments to each of your warehouse crew who will be performing the counts. Either a paper Cycle Count Sheet can be produced for each crew member, or the task can be automated with our ELECTRONIC WAREHOUSE MANAGER Android application. When the ELECTRONIC WAREHOUSE MANAGER app is in use, each warehouse worker will see their counting assignments on their Android tablet. They can either use the barcode scanner or manually enter their counting results on the tablet. The counting results can be viewed on the warehouse manager's desktop computer, and they can force a "recount" of any items that do not look correct. The warehouse worker will then be directed to recount those items. When used regularly and properly, not only will your inventory be much more accurate, once you're in the habit of continuously cycle counting, you'll probably never have to do a full "close the doors and stop everything" physical inventory again!